Video footage shows men handcuffed, lined up for deportation to Bangladesh, where they will become refugees. 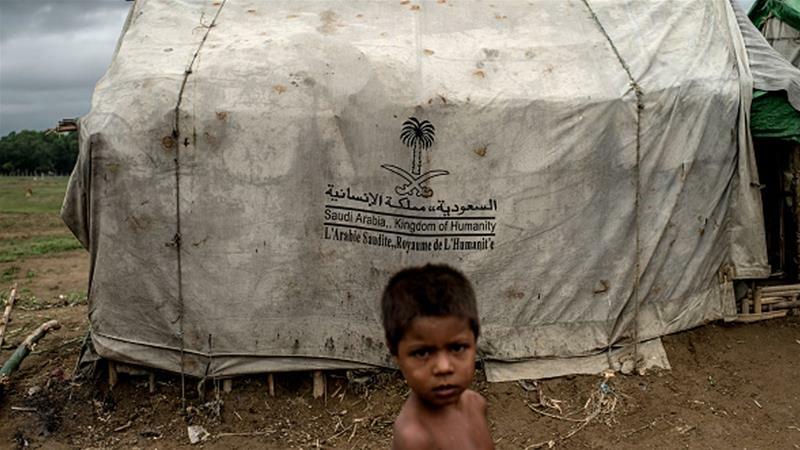 Dozens of Rohingya are being deported from Saudi Arabia to Bangladesh, despite being from neighbouring Myanmar. In video footage sent to the Middle East Eye website on Sunday, men are seen lined up for deportation at the Shumaisi detention centre in Jeddah. The Rohingya man who filmed the footage said that the men who have been locked up in a Saudi detention centre for up to six years were being deported. “I’ve been here for the last five to six years, now they are sending me to Bangladesh. Please pray for me,” the man in the video said. Another recording sent to MEE recounted the events that led up to Sunday’s forcible removal. “They came to our cells in the middle of the night at 12pm [midnight] (9:00pm GMT), telling us to pack our bags and get ready for Bangladesh,” a Rohingya detainee, who wished to remain anonymous, told MEE. Many of them reportedly entered Saudi Arabia on pilgrimage visas but overstayed to work. Some detainees locked up in Shumaisi told MEE they had lived in Saudi Arabia their whole life and had been sent to the detention centre after Saudi police found them with no papers. Nay San Lwin, a Rohingya activist told to Al Jazeera from Frankfurt, Germany, that most of the Rohingya entered Saudi Arabia in 2012 following violence breaking out in Rakhine state, searching for a better life. Since then they have been supporting their families held in refugee camps in Bangladesh. When they land in Dhaka, they will become refugees and transported to refugee camps in Cox’s Bazaar. Nay San explained that upon entering Saudi Arabia, their fingerprints had been registered as “Indian, Pakistani, Bangladeshi, Nepalese” as the Rohingya identity isn’t accepted. “According to Saudi law, since they are registered as a different nationality, we can’t do anything in terms of legal help,” Nay San said. Muslim-majority Rohingya from Myanmar are described as the most persecuted minority in the world. Nearly ome million Rohingya were forced to take shelter in Bangladesh after Myanmar’s army, responding to attacks by an armed group, launched a brutal campaign against the minority in the country’s western Rakhine state in 2017. “They have been in an open-air prison for decades,” Nay San said. “The genocide is ongoing there. No one can have a Myanmar passport to travel outside of Myanmar. Nay San said that human rights activists have been appealing to Saudi authorities for the past two years and that he has approached Saudi officials, diplomats, but “no one is ready to help”. Activists are approaching the European government to appeal to the Saudi authorities, he said. This entry was posted on Wednesday, February 6th, 2019 at 00:03	and is filed under Uncategorized. You can follow any responses to this entry through the RSS 2.0 feed. Both comments and pings are currently closed.